Police vans stand in downtown Muenster, Germany, Saturday, April 7, 2018. German news agency dpa says several people killed after car crashes into crowd in city of Muenster. 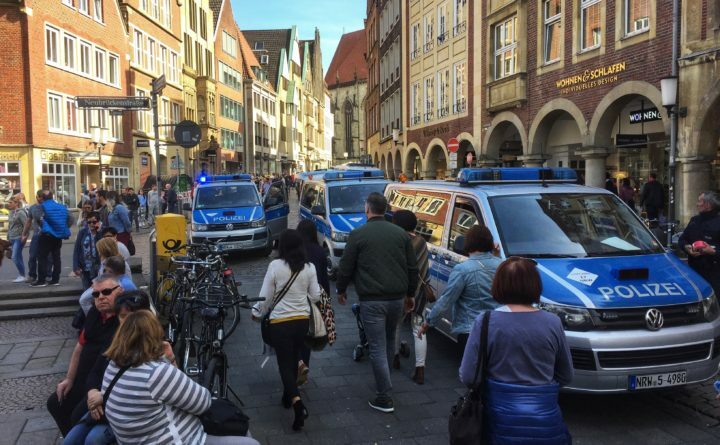 HAMBURG, Germany — A psychologically disturbed man plowed a van into a crowd in the northern German city of Munster on Saturday afternoon, killing two people and injuring 20 before shooting himself, German officials said. The attack sparked fears on a continent that has been hit repeatedly by attacks in which vehicles have been turned into weapons in crowded city centers. But a top German official said that investigators did not believe the attack was by a terrorist. “At the moment, there is no evidence that there is any Islamist background” to the attack, said Herbert Reul, the interior minister of North-Rhine Westphalia, the state where Munster is located. He said the suspect was a German citizen and that investigators are still working to establish a motive. Reul said that two victims and the attacker died in the incident, lowering the toll from what authorities previously said was three victims. A senior German security official briefed on the ongoing investigation said that investigators believe the attacker was the 48-year-old in whose name the van is registered and that he had recently tried to take his life. Police also dispatched a bomb squad to the scene to check whether there were explosives in the van, the senior security official said. The official spoke on the condition of anonymity to describe the unfolding details of the case. The van injured 20 people, six seriously, after it ran into a group of outdoor tables at a restaurant, North Rhine-Westphalia police spokesman Andreas Bode told reporters. Large portions of the city center remained shut down hours later, as helicopters hovered in the sky and police officers with large rifles blocked streets. Images of the city center showed a small delivery van that appeared to have hopped onto a sidewalk off the street and plowed through the seats and tables of an outdoor cafe. Chairs were scattered and broken across a small cobblestone plaza. The incident took place at the square surrounding the Kiepenkerl statue, a city landmark that commemorates a traveling peddler. The Kiepenkerl area is dotted with boutiques, high-end shops and cafes, and is a favorite of both tourists and locals. Saturday was the warmest day of the year, with weather hitting 76 degrees in the city of 300,000, drawing people onto the streets to lounge in the sunshine. “The weather was fantastic, and all restaurants had put chairs outside. There were lots of people,” Simonsen said. Local news outlets said that police were already deployed in larger-than-normal numbers in the city center that afternoon to keep watch over a pro-Kurdish demonstration. When the van plowed across the square midafternoon, officers were able to divert quickly. Vehicles have been used in terrorist attacks across Europe in recent years, including in Germany. In December 2016, a Tunisian man whose asylum request had been rejected crashed a truck through a crowded Christmas market in Berlin, killing 12 and injuring 56. The incident in Munster also came a year to the day after a man driving a stolen delivery truck slammed into a crowd in Stockholm, killing five. Washington Post writers Luisa Beck and Rick Noack contributed to this report.